Precision medicine has a broad definition | Judy Keen, Ph.D.
What is precision medicine? How do you define an individual approach to treatment and health care? When asked for the first thing that leaps to mind when you think “precision” or “personalized” medicine, most answer that it is using genes to determine how to treat a disease. Is this true? Is precision medicine limited to just genes? What is meant by genes? Gene mutations – changes in the gene sequence – can be something that causes a change in gene expression or protein location or not. It could be linked to the development of disease or how a person will respond to therapy or it might not affect anything at all. There is a lot to learn about these gene mutations and how to best capitalize on their existence. The amount of the protein that is expressed from that gene could also predict a treatment option or how well an individual will respond to treatment. Such changes in the protein level may result from a mutation or an environmental exposure. Gene mutation or lack thereof is not the whole picture of precision medicine. What about other health data? Imaging, environmental data (like exposure history) and other diet and lifestyle data is also precision medicine. Having data from different modalities and incorporating different expertise will improve the unknowns about causes and progression of disease. Importantly, the integration of all of this data will best serve patients. When asked about treatments that are determined based on precision medicine, most answer drugs (like chemotherapy for cancer patients). 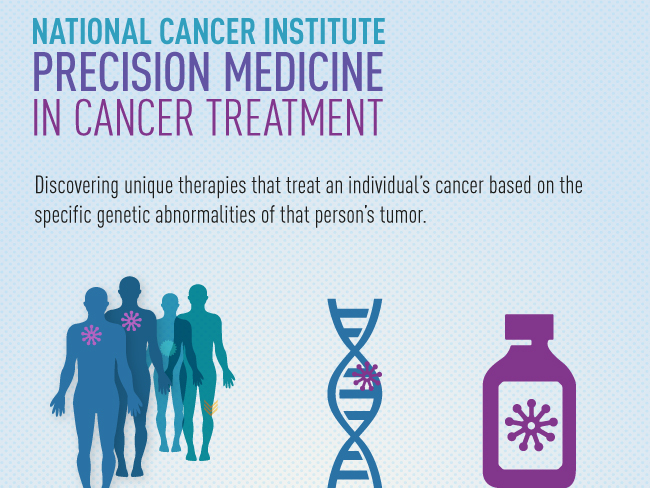 Treatment options that are included in precision medicine are not limited to drug regimes. Other options like radiation therapy, surgery, dietary changes, environmental changes (i.e. Limiting exposure levels) can provide a individualized approach to treatment and care that may be better tolerated and more effective for the patient. The definition for precision medicine is very broad and should be talked about in that manner. Limiting discussion about gene mutations and drug treatment options sells the idea of precision medicine short – and that will ultimately limit the care for patients. In the end, the patients are what it all means.